You may have encountered this poem framed in a bathroom or in some other unexpected place. 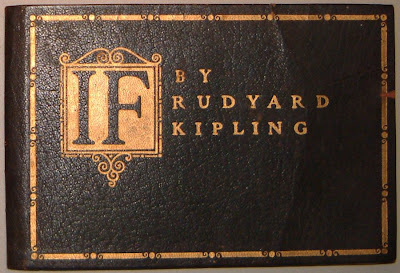 Apparently the author/poet Rudyard Kipling felt it was overexposed during his time. It is less popular now and can withstand a good dusting off. Here are some values and ideas that translate across the decades. Typography: IF by Rudyard Kipling from George O. Horne on Vimeo. As a child did you read this poem and wonder about its meaning? What does your child think about this poem? Which thought is your favourite? Which thought does your child favour? If you were going to add another sentence – perhaps as a lesson for your child – what would you say?